A controversial term first described by Saunders and Harbaugh1 in 1984, Second Impact Syndrome (SIS) consists of two events. Typically, it involves an athlete suffering post-concussive symptoms following a head injury.2 If, within several weeks, the athlete returns to play and sustains a second head injury, diffuse cerebral swelling, brain herniation, and death can occur. SIS can occur with any two events involving head trauma. While rare, it is devastating in that young, healthy patients may die within a few minutes. 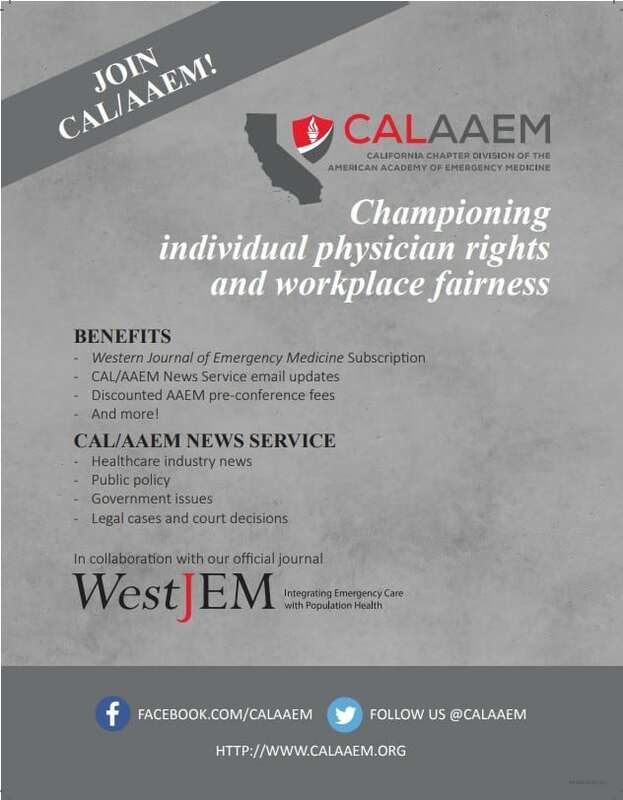 Emergency physicians should be aware of this syndrome and counsel patients and their parents concerning when to allow an athlete to return to play. Furthermore, we present guidelines for appropriate follow up and evaluation by a specialist when necessary. SIS is based on rare and mostly disputed cases in which a second mild head injury in children caused massive cerebral edema. McCrory7 points out that SIS is more likely a condition representing “diffuse cerebral swelling,” a consequence of traumatic brain injury with diffuse brain swelling that is well recognized in children. 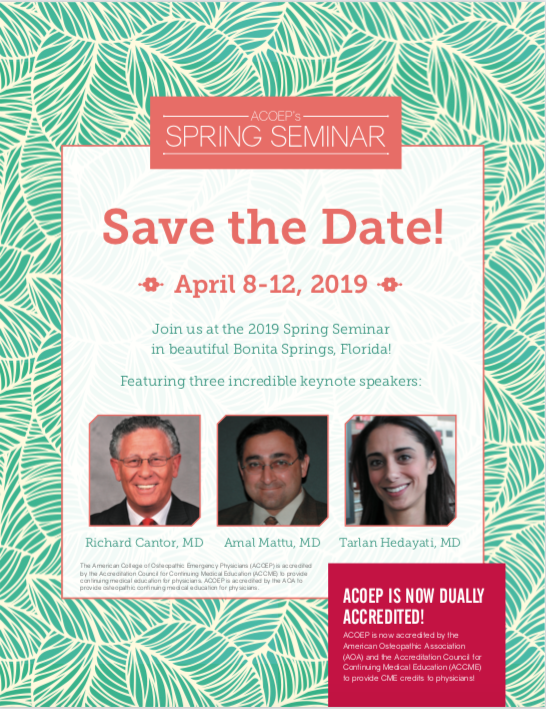 While there is argument over the incidence of SIS, many authors agree that the syndrome is rare.7,8While this may be comforting to emergency physicians (EPs), SIS must still be taken seriously as the consequences could be grave. The word “concussion” comes from the Latin verb concutere (“to shake violently”).11 A concussion is defined as an immediate and transient loss of consciousness (LOC) accompanied by a brief period of amnesia after a blow to the head. In post-concussive syndrome, up to three symptoms arise within less than four weeks from the initial LOC.5These include headache, dizziness, fatigue, insomnia, irritability and alcohol intolerance, and other symptoms, such as subjective concentration, memory, or intellectual difficulties without neuropsychological evidence of marked impairment.5 In an article summarizing the Second International Conference on Concussion in Sport (Prague 2004), McCrory et al.12 differentiate between simple and complex concussions. A simple concussion is an athletic injury that resolves without complications within ten days, whereas a complex one involves persistent symptoms beyond ten days, or additional symptoms of seizures, cognitive impairment or exertional headache or confusion. 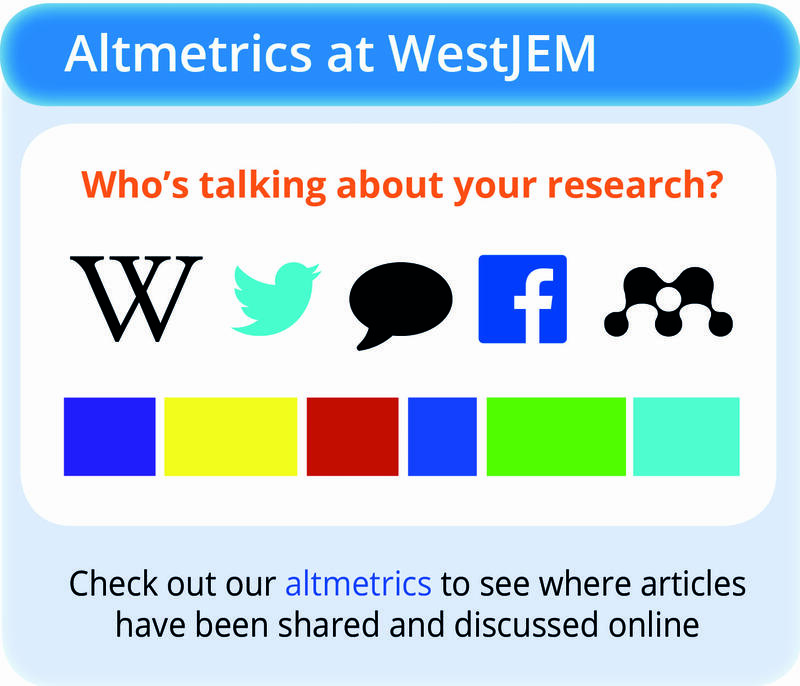 Cognitive domain scores are often calculated from executive, attention and memory testing. Newer high technology methods include Diffusion Tensor Imaging (DTI), which is a more recent method of assessing axonal integrity in vivo. DTI characterizes white matter integrity.14 In a review of 18 cases of young athletes who sustained a second head injury before the first one had resolved Mori et al.8 found, that ten of the 18 did not lose consciousness. 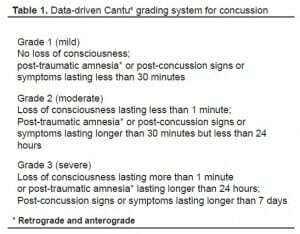 However, after the second traumatic brain injury, eight had a cranial CT scan revealing a subdural hematoma.8 The symptoms and ED presentation of severe concussion can be identical to SIS. The EP is rarely aware of a preceding concussion days to weeks earlier. Therefore, the evaluation and treatment of these two entities follow the same algorithm. A patient who sustains an initial concussion may develop cerebral edema, accounting for loss of consciousness, memory impairment, disorientation and headache. However, the brain’s auto regulatory mechanisms compensate for this mechanical and physiologic stress and protect against massive swelling. This is thought to be accomplished by acutely limiting cerebral blood flow, which leads to accumulation of lactate and intracellular acidosis.15 After the initial phase, a state of altered cerebral metabolism occurs and may last ten days,16 involving decreased protein synthesis and reduced oxidative capacity.11Extensive experimental research suggests that the loss of consciousness after head injuries, the development of secondary brain damage, and the enhanced vulnerability of the brain after an initial insult can be explained largely by characteristic ionic fluxes, acute metabolic changes, and cerebral blood flow alterations that occur immediately after cerebral concussions. Extracellular potassium concentration can increase massively in the brain after concussion, followed by hypermetabolism lasting up to ten days. This makes the brain more vulnerable and susceptible to death after a second sub-lethal insult of even less intensity.11 Fisher and Vaca17 hence conclude that when the patient sustains a “second impact,” the brain loses its ability to auto regulate intracranial and cerebral perfusion pressures. In severe cases, this may lead to cerebral edema followed by brain herniation. Death has been reported to occur in a matter of two to five minutes, usually without time to stabilize or transport an athlete from the playing field to the ED. This demise can occur far more rapidly than that of an epidural hematoma.18 Bruce et al.19point our that brain swelling in minor head trauma is more significant in small children than in adults. The term “malignant brain edema” has been used to describe this phenomenon. More research in this area is necessary to determine if and when malignant brain edema and SIS are related, or even if they occur by the same process. Airway, breathing, and circulation must be assessed and treated following any head trauma seen in the ED or in the prehospital setting. Even in the absence of hard signs suggesting cervical spine or spinal cord injury, such as posterior midline pain or tenderness, paresthesias, extremity weakness or depressed consciousness, injury should be assumed and immobilization and radiography routine. A thorough history is imperative and must be taken from the patient, if conversant, or from a witness. 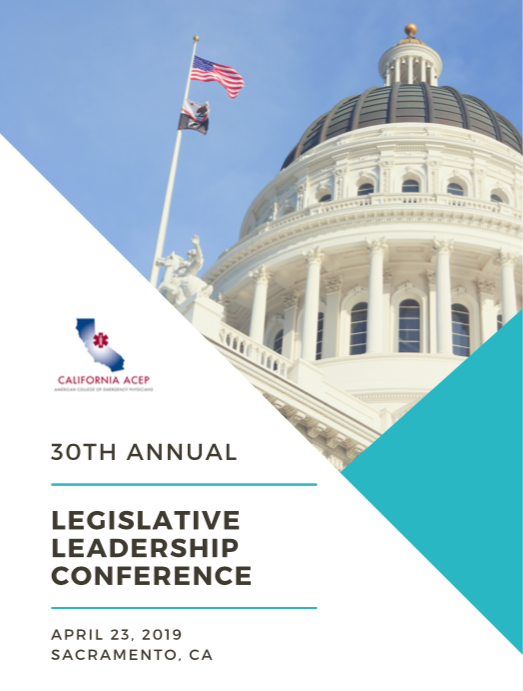 Important information includes mechanism of injury, loss of consciousness, previous concussions, seizure history, transient weakness or paresthesias, difficulty walking, bladder or bowel incontinence, and alcohol or drug use. A thorough general physical exam should be performed with special attention to the neurological exam. If there is suspicion of a serious structural brain injury, immediate computed tomography (CT) of the head is needed.20 CT is usually easier to obtain and more sensitive than magnetic resonance imaging (MRI) to detect acute intracranial bleeding and identify surgically reversible injury.21 The CT scan should be reviewed for intraparenchymal, extra-axial, intraventricular or subarachnoid bleeding, diffuse cerebral swelling manifested by loss of the grey-white junction, and midline shift. In case of an anatomic abnormality, a neurosurgeon should be consulted. Any athlete who still shows signs of concussion should not be allowed to return to play. Such signs include fatigue, headache, disorientation, nausea, vomiting, feeling “in a fog” or “slowed down,” as well as other differences from a patient’s baseline.18 If there are any doubts about the severity of injury, the patient or athlete should not be allowed to resume play. The difficulty lies in deciding the appropriate return to play when the athlete is completely asymptomatic. Parents, teachers and the coach must observe the athlete closely. High school athletes and those with scholarship possibilities, especially, will try to convince parents and coaches that they feel fine, in order to resume play. 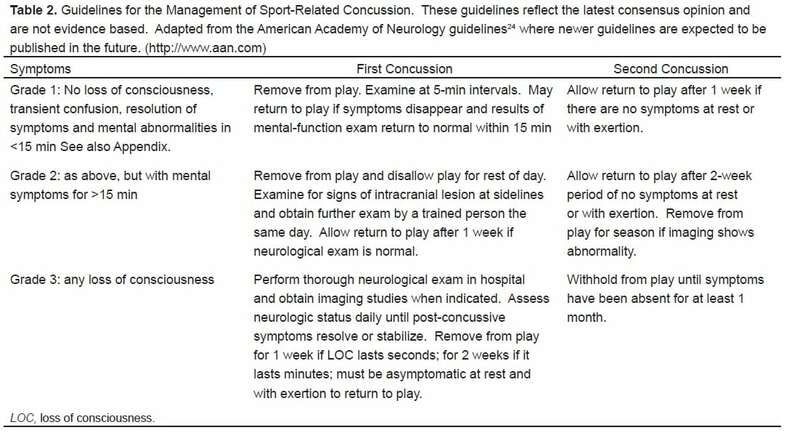 There are differences of opinion as to when it is appropriate for a post-concussive patient to resume play. 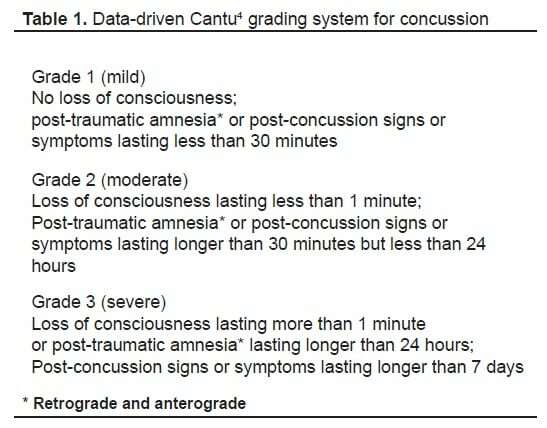 Cantu18 suggests a grading system to rate the severity of concussions, ranging from Grade 1 through Grade 3 (Table 1). Three widely referenced clinical guidelines advise on the timing and level of participation after a first concussion.3,4,5 Unfortunately, none are evidence based, and their recommendations differ widely. 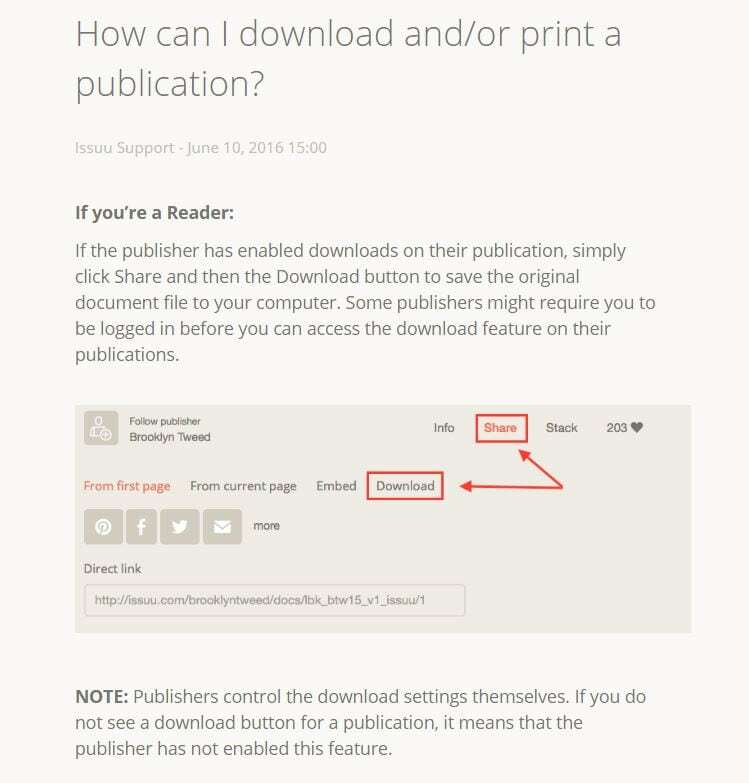 Some even discuss a stepwise approach to return to play. The EP should focus on the initial stabilization, imaging and the exclusion of a life-threatening or surgically-treatable lesion. 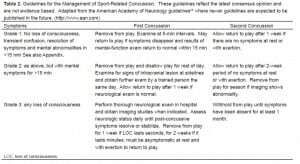 The EP should also ensure appropriate outpatient follow up by a neurosurgeon or a sports physician who has expertise with concussive symptoms. Although information on SIS is present in the medical literature, its description in 1984 may leave some non-specialists unaware of the potential danger. Currently the guidelines suggested by the American Academy of Neurology26 listed in Table 2 are the most widely disseminated and used. The most sensible approach to prevention is to prevent the first concussion. For soccer, Kangaroo Soccer Headgear, similar to that used in martial arts, is primarily intended to provide protection for children and youth players. Coverage extends around the head, including the ears. The headgear is intended to protect against player-to-player impacts.27 These headgear models did provide measurable benefit during head-to-head impacts, but not necessarily with ball impact. Experts advise wearing a helmet during high-impact contact sports and preventing or mitigating especially head-to-head contact. 4. Cifu D, Steinmetz BD, Drake DF. Repetitive head injury syndrome. [Accessed August 29, 2008];eMedicine. 2008 March 24; Available at:http://www.emedicine.com/sports/TOPIC113.HTM. 8. Mori T, Katayama Y, Kawamata T. Acute hemispheric swelling associated with thin subdural hematomas: pathophysiology of repetitive head injury in sports. Acta Neurochir [Suppl] 2006;96:40–43. 17. Fischer J, Vaca F. Sport-related concussions in the emergency department. Top Emerg Med. 2004;26:260–266. 23. Wakai A, Roberts I, Schierhout G. Mannitol for acute traumatic brain injury.Cochrane Database of Systematic Reviews. 1998;(Issue 1) Art. No. : CD001049. 24. Neurotrauma. Intracranial pressure. [Accessed May 8, 2008]. Available at:http://www.trauma.org/archive/neuro/icpcontrol.html.